Vice President Joseph R. Biden Jr. and his associates have begun to actively explore a possible presidential campaign, an entry that would upend the Democratic field and deliver a direct threat to Hillary Rodham Clinton, say several people who have spoken to Mr. Biden or his closest advisers. Mr. Biden’s advisers have started to reach out to Democratic leaders and donors who have not yet committed to Mrs. Clinton or who have grown concerned about what they see as her increasingly visible vulnerabilities as a candidate. The conversations, often fielded by Mr. Biden’s chief of staff, Steve Ricchetti, have taken place in hushed phone calls and over quiet lunches. In most cases they have grown out of an outpouring of sympathy for the vice president since the death of his 46-year-old son, Beau, in May. On Saturday, Maureen Dowd, the New York Times columnist, reported that Mr. Biden had been holding meetings at his residence, “talking to friends, family and donors about jumping in” to challenge Mrs. Clinton in Iowa and New Hampshire, the first two nominating states. One longtime Biden supporter said the vice president has been deeply moved by his son’s desire for him to run. Mr. Biden’s path, should he decide to run, would not be easy. Mrs. Clinton has enormous support among Democrats inspired by the idea of electing a woman as president and her campaign has already raised millions of dollars. Mr. Biden, who is 72, has in the past proven prone to embarrassing gaffes on the campaign trail, and he would also face the critical task of building a field operation. 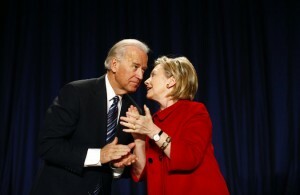 One Democrat with direct knowledge of the conversations described the outreach as a heady combination of donors and friends of Mr. Biden’s wanting to prop up the vice president in his darkest hours, combined with recent polls showing Mrs. Clinton’s support declining, suggesting there could be a path to the nomination for the vice president. In a July 30 Quinnipiac poll, 57 percent of voters said Mrs. Clinton was not honest and trustworthy and 52 percent said she did not care about their needs or problems. The same poll showed Mr. Biden with his highest favorability rating — 49 percent — in seven years, with 58 percent saying he is honest and trustworthy and 57 percent saying he cares about them.